In this annual report, I emphasize the Beaty Biodiversity Museum’s (BBM) efforts to extend our reach and make connections in celebrating biodiversity and biodiversity research. 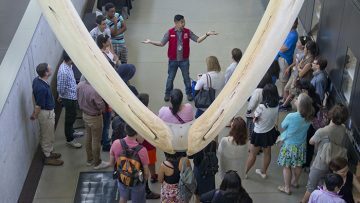 When speaking of “making connections,” the term is often used to refer to efforts to “engage with a community,” an expression that has been criticized as often being simply a marketing ploy rather than a sincere effort to fulfill the mission of a museum. In an interesting blog written by Nina Simon, much of the effort at “connecting with a community” was likened to museum folks running around with “a heat-seeking metal detector on the hunt for a miscellaneous batch of folks” who could be stunned “into connection.” Ouch! Simon then outlines several key efforts that should underline attempts at connecting with the diverse museum-going, and in our case, biodiversity community. I read on with some trepidation about how the BBM would fare when evaluating our efforts against Simon’s suggestions. I am, however, very pleased to report that the work of folks at the BBM seems to hit all or most of the key aspects of making the BBM more than just a “third place” (home and work being places one and two). For instance, our policy of free entrance to students, faculty, and staff at UBC and our efforts at encouraging diverse visitors with reduced rates hits the “Be free, nearly free, often free, or free to locals” tip. Second, our surveys of visitors have helped us to define who we attract and where we could grow, and hit the “Pick a community (or two)” suggestion. Our Nocturnal program (when the museum is open late one Thursday of the month and features a special event such as the popular “Hops” night) is a good example of Simon’s tip to “Be open at times when your community is likely to come”­ — a move that increases the chances of a BBM visit being part of “evening recreational time.” Importantly, the BBM curatorial staff is very active in meeting with visitors, either by giving tours, workshops, or talks, which Simon suggested as a way to “Make time for staff to hang out with visitors.” Finally, our “Sneak-a-peek” events for members is a good example of Simon’s plea to find ways to “Appreciate regulars.” The BBM’s work at making connections also included receipt of three dinosaur “trackways,” reproduced in cast form by the Peace River Palaeontology Research Centre (PRPRC) in north-central British Columbia. These trackways, when complete, will help connect visitors with life forms that existed between 90 and 140 million years ago, as well as connecting the work of two institutions (the BBM and the PRPRC) in diverse areas of British Columbia. Finally, we at the BBM are very pleased with the success of the Beaty Box program (see the Education and Outreach report) which has been very successful at connecting our specimens and biodiversity science with children in schools across the Lower Mainland. Clearly, the BBM is making connections across diverse communities. In closing, I appreciate all the visitors who chose to make the BBM part of their day this past year. Their visits benefited from all the work of our dedicated volunteers (over 160! ), work-learn students, staff and faculty, and our donors. I appreciate and marvel at your commitment to the BBM. Of course, and on behalf of all at the BBM, the positive experiences of visiting and working at the BBM would not be possible without the tremendous support that we receive from all those at the Faculty of Science, led by our Dean, Dr. Simon Peacock. Our work is also aided greatly by Drs. Lacey Samuels and Sean Graham (former and current Heads, respectively, Department of Botany), and Bob Shadwick (Head, Department of Zoology). Thank you for that support. Download the 2016-2017 Beaty Biodiversity Museum Annual Report (PDF).